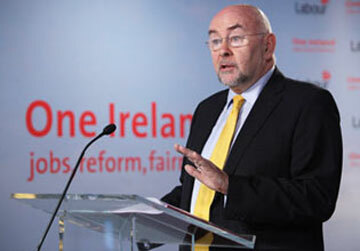 Ruairi Quinn – what a disappointment! “My heart goes out to any parent with a child with special needs,” he said this morning. “I’m blessed that I’m not in that position. One couldn’t but empathise with the anguish and the energy that parents with a child with special needs display. Any mother, any father would go through the wall for their child and I understand that. “What I’m saying is the amount of special needs teachers has grown exponentially since the time they were introduced and we’re going to look at how to use them more effectively. “The Republic of Ireland has lost its economic sovereignty. We are effect in receivership. We don’t control our financial destiny at the present time. We can only get the money to pay a lot of people based on the terms of the troika bailout deal,” he said. Addressing the INTO conference yesterday, he warned teacher union delegates of a stark and difficult road ahead. In his first address as Minister for Education, he outlined the range and extent of the economic crisis and said he wanted to be frank about the resources available. The Minister said that “the budget figures for 2011 will stand and will not be reviewed” and there was no commitment to reverse the 10,575 cap on the number of special needs assistants. The Minister stressed that resources for education would not be improved, and that earlier decisions would not be reversed. “To put it bluntly, the money dispensed by ATMs to all public servants . . . is made available to Ireland by the European Central Bank at fortnightly intervals. Every two weeks the governor of the Irish Central Bank, Patrick Honohan, has to confirm to the ECB that Ireland is meeting the terms of the bailout,” Mr Quinn said. He reminded delegates that there was a trade-off to be made for the Croke Park agreement that included a net reduction in teacher numbers in 2011. These are Ruairi Quinn’s words yesterday at the INTO conference in his first speeech as Minister. This hard man talk is really easy to do when you are talking about depriving special needs children of their education – after all they can’t exactly do anything about it! It is not empathy we want as parents of special needs children – we want action – and that action is just to implement Governmment Policy of the last 20 years as set out in the Salamanca Statement and is actually in legislation with the EPSEN Act 2006. Why be so dam arroagant about what can and cannot be done – why was that same attitude and beligerance not found when ex AIB Managing Director Colm Doherty walked away with Ruair Quinns Blessing with 3 million euro of unearned income. Where was all the fighting talk when it came to renegotiating the terms of the bailout -as Mr Quinn’s party said they would do before being elected. Another fraud has just been perpertrated on the Irish people by electing a Government who promised us real Change but who have in actual fact not only brought no change – but have reiterated that they actually don’t intend changing anything. Blaming the EU for not having the courage to implememt real change is not something you should be proud of Mr Quinn. Reforms that are needed are ultimately cost beneficial. “Any mother, any father would go through the wall for their child and I understand that” ….. actions speak louder than words – I am sure that must have come up in one of those stories read to you at bedtime! SHAME ON YOU! FURY erupted last night over a decision to deprive children with severe disabilities from getting a second full year of pre-schooling, the Irish Independent has learned. The move, which will save less than €500,000 a year, will hit families of Down Syndrome children, those with autism and other severe disabilities. Many had assumed their children could avail of a second year, but now their hopes have been dashed. Instead, they have been given the option of a full year starting in September, with their children attending Monday to Friday, or splitting the provision over two years. The INTO last night described the move as a “shocking and mean spirited” decision by the Government, which had promised as far back as 2002 to ensure early education services for children and prioritise children with disabilities. The highly successful free Early Childhood Care and Education pre-school year began in January 2010. An overwhelming 94pc of eligible children are now participating in the scheme. About 170 children with severe disabilities were allowed to avail of a second full year starting last September. They were approved on a case by case basis. But Children’s Minister Barry Andrews‘ office has decided this will not be available to children starting in September this year. A spokesman for the minister said the 170 children were allowed to enrol in the second year because the first free pre-school year was a “short” one”, having started in January 2010 and finishing in June. “No child at any stage has ever been approved for two full years,” he told the Irish Independent. But the decision has angered many parents. “As parents, we will not sit on the fence on this. Our children are already facing sweeping reductions in services due to drastic cutbacks,” said Down Syndrome Dublin chairperson Miriam Masterson. She said the decision could not even be considered a cost-saving measure, when these same people will, in later years, require a lot more help than if they had been given the best start from the outset. Irish Preschool Play Association chief executive Irene Gunning said the decision was very disappointing as it had not been signalled in advance and parents had an expectation of a second year. However, Fine Gael last night held out the prospect of reversing the decision. Fine Gael education spokesperson Fergus O’Dowd said the party was committed to spending €20m on a First Step programme to help disadvantaged pre-school children. He said this would include those with severe disabilities. “A Republic is judged by the manner in which it treats its most vulnerable citizens,” Mr O’Dowd added. Mainstream Education for Special Needs Children- Significant Research! There is a strong research base to support the education of children with disabilities alongside their non-disabled peers. Although seperate classes, with lower student to teacher ratios, controlled environments, and specially trained staff would seem to offer benefits to a child with a disability, research fails to demonstrate the effectiveness of such programs. (Lipsky, 1997; Sailor 2003). Students with disabilities in inclusive classrooms show academic gains in a number of areas, including improved performance on standardised tests, mastery of IEP (Individual Education Plans) goals, grades, on-task behaviour and motivation to learn ( National Centre for Education Restructuring and Inclusion, 1995). Moreover, placement in inclusive classrooms does not interfere with the academic performance of students without disabilities with respect to the amount of allocated time and engaged instructional time, the rate of interruption to planned activities and students’ achievement on test scores and report grades. (York, Vandercook,MacDonald, Heise-Neff, and Caughey,1992). The types of instructional strategies found in inclusive classrooms, including peer tutoring, cooperative learning groups, and differentiated instruction have been shown to be beneficial to all learners. For example, Slavin, Madden, & Leavy (1984) found that math scores for students with and without disabilities increased by nearly half a grade level as a result of working in cooperative learning groups. In addition, children with intellectual disabilities educated in general education settings have been found to score higher on literacy measures than students educated in segregated settings (Buckley, 2000). A national survey by Public Agenda, When its Your Child : A Report on Special Education from the Families Who Use It, revealed that a large majority (70 percent) of the parents sya that too many children with special needs lose out because their parents don’t know what’s available to them. More than half (55%) said that parents don’t know what’s available to them. More than half (55%) said that parents have to find out on their own what service and supports are available. This finding underscores the need to provide more training and information to parents on how the special education process works and thier rights. National Council for Special Education – A help or a hindrance? The National Council for Special Education (NCSE) was set up to improve the delivery of education services to persons with special educational needs arising from disabilities with particular emphasis on children. The Council was first established as an independent statutory body by order of the Minister for Education and Science in December 2003. Their local service is delivered through their national network of Special Educational Needs Organisers (SENOs) who interact with parents and schools and liaise with the HSE in providing resources to support children with special educational needs. A key aim of the Council is to progressively improve the co-ordination between the education and health sectors in providing the supports for children with special educational needs. They are doing this through participation in the Education/Health Cross Sectoral Group which includes representation from the Department of Education and Skills, the Department of Health and Children and the HSE at national level and through interaction with the HSE and their service providers at local level. They now have a substantial research programme under way and will soon be publishing the results of the first of the projects. This research they claim will help to inform best practice in the special education area and provide a basis for developing policy advice as appropriate. Does this imply that the the Salamanca Statement on Special Needs Education is not the policy? The remit of the Council will be significantly extended as the EPSEN Act 2004 is commenced. While certain sections of the Act have been commenced, the implementation of key sections which confers statutory rights to assessment, education plans and appeals processes on children with special educational needs has been deferred due to the current economic circumstances. However, the Council will continue to work towards achieving the ambitions of the Act in every way possible, pending its commencement. Why aren’t the Council protesting that they cannot do their work properly because of cutbacks? The Council’s research report on the Role of Special Schools and Classes in Ireland is a very poor and would suggest that the council will soon become part of the problem rather than a provider of solutions! This council despite it’s good intentions is failing miserably to effect change in Special Needs Education and given that it does nothing to fight cutbacks that dramatically affect special needs education – its’ members should do the decent thing and resign! The book, entitled Inclusion or Illusion, is a comprehensive study of pupils with mild general learning disabilities, who are educated in mainstream and special classes in national schools and designated special needs schools throughout Ireland. These students form the largest section of Ireland’s special needs education population. Authors, Professor of Education, Mona O’Moore of Trinity College Dublin’s School of Education and Dr Paul Stevens, School Principal of Scoil an Chroí Ró Naofa, Castletownbere, Co Cork, gathered data from over 900 teachers between 1989 and 2007 for this research. The study illustrates improvements in school facilities, educational resources and an increase in the number of special needs teachers all directly attributable to government investment. Equally, the study identifies serious difficulties within the education sector, associated with systemic issues of inadequate capacity, structural deficiencies and unaddressed anomalies which are multi-faceted, intangible and complex. These include poor levels of inclusive practice, inappropriate pupil placement, and a severe lack of access to appropriate support services. Based on teachers’ own experiences and combined with a history of state policy in the area of special needs education the book assesses the developments that have been made in this field so far, what the barriers are to progression, and what can be done to overcome these. Hazel Court – a model for the future! Peter Gordon runs Hazel Court school, a special school in Eastbourne for children with severe learning difficulties – 70 per cent of pupils are autistic – on the same site as a mainstream school. He also runs a further education unit for 16- to 19-year-olds alongside a local FE college. He believes his students get the best of both worlds. “We’ve got specialised staff and superb facilities here. We’ve got a hydrotherapy pool and a soft play area, but we’ve also got access to two dining halls, an assembly hall, sports facilities and the library in the mainstream school. “Half our children go to some lessons in the mainstream school, and loads of their youngsters come over to us every day to help with classes. They look at what our children achieve, and learn to have respect for them. This is quite a deprived part of Eastbourne, but we’ve never had one incident of bullying. We share the same uniform and we join in on school trips. Batt O Keefe TD Minister for Education and Science making renewed enquiries! Batt O Keefe T.D. Minister for Education and Science has informed us that he is making renewed enquiries about our issues. Let’s hope that he takes a personal interest in this case as we feel that unless he or somebody at his level intervenes then it will be rather more time consuming for us to succeed in achieving our objectives. Further to your letter of 2nd September 2009 – I am writing for further clarification in relation to the matters I raised. 1 You say that the application to your Department for funding for a new school has been assigned a 1.2 band rating. What does that mean? 2. Is there a site for the new school selected and paid for? 3. How many pupils will the new school cater for? 4. You say that it “is not possible to give an indicative timeframe for the progression of the project at this time” Why not? It should always be possible to give an indicative timeframe. It is extremely disappointing and distressing that you and your department would appear to be treating this matter is such a casual way. The building of this new school should be a priority because of the unacceptable condition of the existing school. Furthermore a new school building accommodating the needs of special needs children in Fingal will have an enormous impact on so many people’s lives. There was no problem spending over €250,000 refurbishing an existing office for Bertie Ahern- but the education needs of special needs children in Fingal have to wait? I think this is a disgrace and I urge you to address this issue as a matter of supreme urgency.